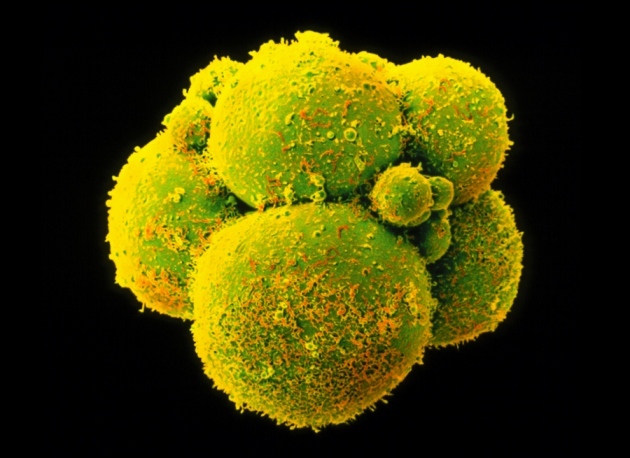 In a world first, Chinese scientists have reported editing the genomes of human embryos. The results are published1 in the online journal Protein & Cell and confirm widespread rumours that such experiments had been conducted—rumours that sparked a high-profile debate last month2, 3 about the ethical implications of such work. The technique used by Huang’s team involves injecting embryos with the enzyme complex CRISPR/Cas9, which binds and splices DNA at specific locations. The complex can be programmed to target a problematic gene, which is then replaced or repaired by another molecule introduced at the same time. The system is well studied in human adult cell and in animal embryos. But there had been no published reports of its use in human embryos. Huang and his colleagues set out to see if the procedure could replace a gene in a single-cell fertilized human embryo; in principle, all cells produced as the embryo developed would then have the repaired gene. The embryos they obtained from the fertility clinics had been created for use in in vitro fertilization but had an extra set of chromosomes, following fertilization by two sperm. This prevents the embryos from resulting in a live birth, though they do undergo the first stages of development. Huang’s group studied the ability of the CRISPR/Cas9 system to edit the gene called HBB, which encodes the human β-globin protein. Mutations in the gene are responsible for β-thalassaemia. His team also found a surprising number of ‘off-target’ mutations assumed to be introduced by the CRISPR/Cas9 complex acting on other parts of the genome. This effect is one of the main safety concerns surrounding germline gene editing because these unintended mutations could be harmful. The rates of such mutations were much higher than those observed in gene-editing studies of mouse embryos or human adult cells. And Huang notes that his team likely only detected a subset of the unintended mutations because their study looked only at a portion of the genome, known as the exome. “If we did the whole genome sequence, we would get many more,” he says. But Edward Lanphier, one of the scientists who sounded the warning in Nature last month, says: “It underlines what we said before: we need to pause this research and make sure we have a broad based discussion about which direction we’re going here.” Lanphier is president of Sangamo Biosciences in Richmond, California, which applies gene-editing techniques to adult human cells. Huang now plans to work out how to decrease the number of off-target mutations using adult human cells or animal models. He is considering different strategies — tweaking the enzymes to guide them more precisely to the desired spot, introducing the enzymes in a different format that could help to regulate their lifespans and thus allow them to be shut down before mutations accumulate, or varying the concentrations of the introduced enzymes and repair molecules. He says that using other gene-editing techniques might also help. CRISPR/Cas9 is relatively efficient and easy to use, but another system called TALEN is known to cause fewer unintended mutations. Previous Need Another Reason to Hate Facebook? Next Databases, Databases, Can They Make Life Safe?